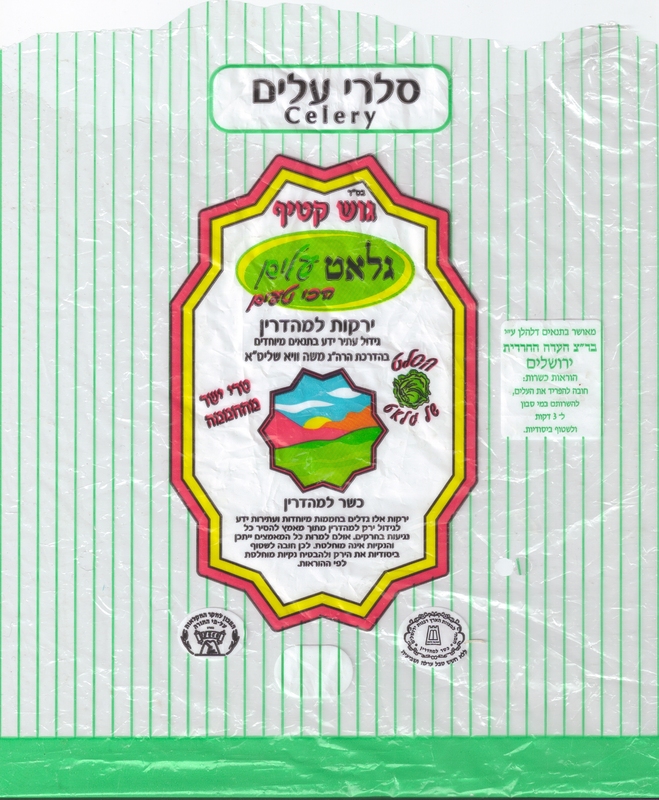 Permit me to begin by stating when I use the term “gush katif”, I am not referring to the former Jewish community nor am I referring to any specific brand name but to the many brands of vegetables grown in a controlled rabbinically supervised environment to provide us with insect-free products. I have been noticing a growing number of vegetables, particularly the types that require rabbinical supervision to attest to their insect free status, being sold in plastic boxes or Styrofoam trays with shrink wrap around them. I have also seen romaine lettuce in plastic bags too similar to the ‘gush katif’ brands. It is imperative for you the kosher consumer to realize that not all of these are the ‘gush katif’ variety and many are regular products lacking rabbinical supervision regarding insect infestation. The product may indeed have rabbinical supervision to cover tithing (trumos and maasros) but that hashgacha does not assume responsibility concerning insects. What prompted me to issue this information message is the latest product I found in the shuk, fresh corn on the cob and broccoli. They both have labels attesting to being “organic and free of insects”. While the items are sold in a store that has Badatz Agudas Yisrael supervision, the latter only covers tithing and has absolutely nothing to do with insect infestation. This is also true of at least one store that comes to mind in Machane Yehuda with a Badatz Machzikei Hadas/Belz hashgacha too. 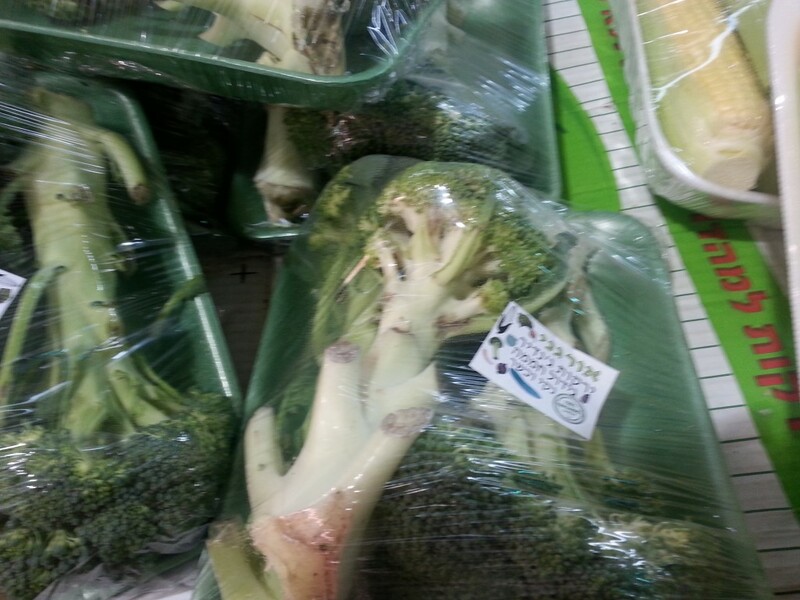 I walked through the shuk earlier this morning and saw a number of vendors selling broccoli on Styrofoam trays and wrapped in clear shrink wrap. None claim to ‘gush katif however if you do not take the time to read, you may miss this fact. I carry a magnifying glass since often the fonts of the wording are too small for me to read. I am unwilling to make do with a circle and a lot of scribble that we assume to rabbinical supervision. Regarding the two organic products mentioned above, if you follow the rabbonim who say corn on the cob is fine, then you only need concern yourself with the broccoli. If you following rabbonim who feel is problematic, then you need to adhere to this for both items. I cannot say if the products are free of insects or not, but I can say there is no rabbinical supervision whatsoever backing the claim that they are. In addition, when you see the term “organic” that generally alerts us to more infestation, not less, but then again, this might possibly be an exception but no rabbi is shouldering the responsibility to back the claim that the products are clean. Posted on October 28, 2013 by JKN Israel. This entry was posted in JKN Alerts, Machane Yehuda - The Shuk. Bookmark the permalink. 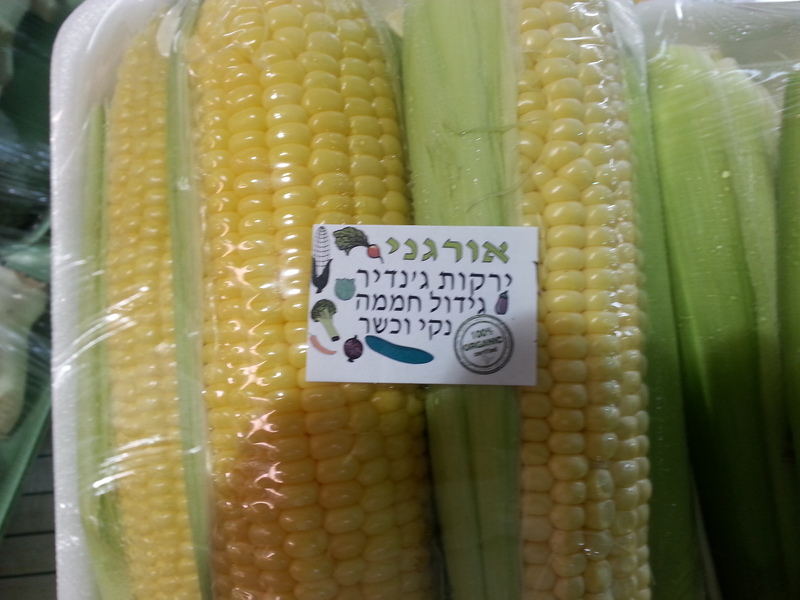 rav vaya gives a heksher to a brand of corn on the cob that is bug free and with minimal residual pesticides. I am a bit confused. What do the words נקי וכשר mean. if not insect free? Not only is there no certification for their alleged bug free status, there is no apparent certification for their claimed organic status. Moshe, your translation of the words is correct. I point out there is no hashgacha to assume responsibility for that claim. That is the entire point of this post. Someone here in RBS sells bug free kale. I think it is also supposed to be organic. How can I decide if the hashgacha is okay? I think the seller said it has a rabbanut Yerushalayim hashgacha but I am not sure. Is there a list of recommended hashgachas for bug free products? How do I know if the hashgacha of any product is regarding insects or trumot umaasrot or both? The way to ascertain if a hashgacha covers tithes and insects or just tithing is to read the sign posted in a store, or on the label of a product. If there is no sign, just a product label, which lacks the information you see, you must contact the hashgacha for clarification. this is excellent & important info, but how can find out the answer? since you are so good at this, can you also provide the phone # of the hashgachos? forgive me for asking you to do this, but I can tell you that except rav efrati<s # I spent almost antire day trying to find anyone to give answers. thank you again for your avodat hakodesh. On the upper right side of the homepage is a link to “Kashrus Agencies in Israel – Directory”. Many hashgachos are there.